Have you ever wondered to install your kitchen in your basement ? Oh ! Yes, you guessed it correctly, this article is about Kitchen In Basement and it will provide you every little information about the topic and will try to calm your mind which is now overexciting due to volcanic eruptions of questions. Now first volcanic eruption of question which would be provoking your mind would be – ” Why kitchen in basement is a good idea ? “. It seems to me that you are asking me a question whose answer is known by you. ” Whaaat ! !, I already know the answer ?” , Well , Yes. Let me try to put all answers out of you and for that you will have only to answer me a few questions. My first question from you is that ” Did you need some extra space in your house to manage things more clearly and smoothly ? “, My second question from you is that ” How does it feels to you that when you have to go every time upstairs whenever you need something from kitchen ? ” , My third question from you is that ” Is your house at sale and you want to offer your customer a fully different kitchen ? “. I have many questions like these to ask from you but my these three questions are just enough for you to put out answer of your question from you only and I am sure that till now you would have definitely found at least one of the reasons that why one should have his or her kitchen in his or her house basement ? and leave the other remaining reasons and questions to be answered on this article. 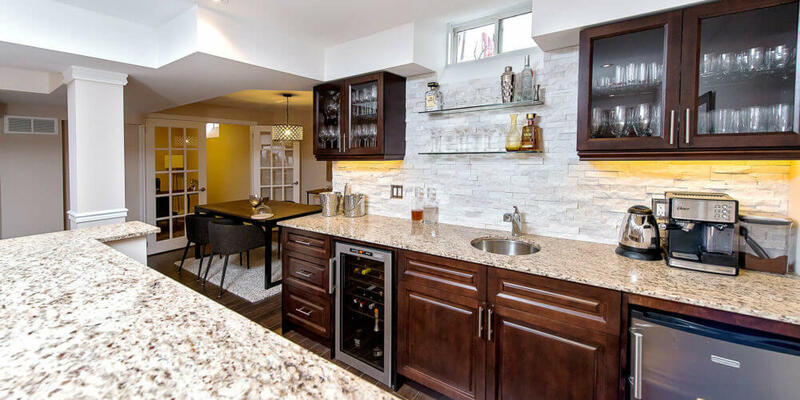 So, Now you have known that how do you already familiar with the benefits of having kitchen in you basement but let me things more clear to you in order to have a right decision. So listening this term ” Kitchen In Basement”, the first question rising in your mind is already known but let me give more clear and factual answer for this question. The first benefit of having kitchen in your house basement is that suppose if you want to keep your house on rent then what would be the first thing which will be seen by your customer. Yes, its The Kitchen. No body wants to share his or her kitchen and the kitchen would be the first priority which will affect fully you house sale service. In a market study, researchers found that a building when had a basement kitchen with it returned homeowner an 85% return on investment than a building without a basement kitchen.The second benefit or reason of course carries the accessibility of an extra space. This is the second and most important benefit of all available. Every one nowadays wishes to design and decorate their house and wants to keep their kitchen comparable with those in movies and advertisements but one of the common problems that every single encounter is the accessibility of space. Does having your kitchen in your house basement solves this problem, Oh Yes !, it is the solution of this problem.One more reason which is best of all is one more kitchen in very less price.Yes, Basement kitchens are cheaper than any other. So why one would not like use this offer and create some more space in his or house in a very less price as …Well…you know. As told previously that there are infinite many reasons that would really help you lot only due to having your kitchen in your basement but these some reasons are quite important than all of their kind. So, after having this active volcano named ” Why is kitchen in basement a good idea ? ” set to dormant value, lets move on to the next one.The next question comes The Budget !!!. Every one who had enjoyed a good life has always cared for his or her budget and here comes the same thing. The Basement kitchens are cheaper in comparison to normal ones. But yes everything in this project depends on your design and the look and feel you wish to give to your kitchen. The budget will run through skies if you put and awesome and astonishing design and will flow below your foots if you give your kitchen a design according to your budget.The final line for budget in this article I want to say is that Basement Kitchens are cheaper than that of normal ones. Stop! Stop ! Stop ! , Don’t think that making kitchen in basement is very easy and you can simply now shift your kitchen. Believe me, It is not easy. It is not easy not only due to the work required in it but also due to some government policies. ” Government Policies ? !!!!!!! ” , Well Yes, In some countries, small basement kitchen is an illegal act without verification of some factors like sufficient air, light, eagerness ,etc. by The Department of Buildings. Your kitchen should meet the minimum requirements that are needed to make a basement kitchen and needs to be verified legally and lawfully by The Department of buildings.Any illegal act can lead you behind the bars and may charge you penalties. But the main question which really as commonly seen rises in everyones mind is that ” Why did The Government do that ? “. Oh ! don’t now blame The Government, before doing that first know that why is your government doing this with you.The Government always wants only your and your families and every other citizen’s welfare and it is just doing this for you. Making kitchen increases the risk of fire-explosions and other dangers as the harmful gases which are released using cooking equipments does not get the environment in which they are mixed and get due to this they start being stored in your kitchen area only which ultimately increases the temperature and inflammation rate of your kitchen environment. And that’s the reason why your government has created some specific rules to be followed when making kitchens and other rooms in your basement renovation project. Step 1: Getting Every-Thing Ready – This is the first and starting step of you aim which will be further converted into reality. This step includes the starting of your aim and in order to complete this step your availabilities should meet these requirements – You should be ready with a sketch paper, a pencil and Of Course you should have a house with basement and Yes, a budget. Check properly and if you meet these requirements then continue otherwise first try to achieve these requirements. You Kitchen’s area should be calculated and fitted according to your house basement. Your Kitchen Map should contain all components you require. Your Kitchen Map should contain a good contact with open environment. Your Kitchen Map should follow all the rules and regulations created by The Government. Your kitchen must have proper fire exits. Your kitchen must have a fire safety alarm so that whenever it comes a chance to any kind of safety, it can notify before something happens you. Step 3: Teach Some Mathematics To Your Map And Verify It – In order to complete this step verify that you have completed previous step nicely and you have no violations to the rules and regulations. If you have successfully completed previous step brightly then continue on with this step’s requirements. This step requires some mathematical skills.Yes, you guessed it ! . It’s the calculation of your map.Calculate your map according to your basement and create a final sketch which is well calculated and yes, make sure that all the steps till now you have accomplished has no mistakes. If anywhere you find errors, re complete that step and after it try to again after follow this step. It is important to layout your kitchen with perfect place for different – different kitchen equipments and objects – helpers like Fire exits, Dishwasher, etc. Keep your kitchen color bright and fresh in order to make your kitchen look neat and clean and provide a fresh feel to it’s user. Try to match colors on one object to that of others. Keep changing colors until you find the best match which satisfies you. Check that if your kitchen design satisfies your budget. If it satisfies, continue otherwise redesign according to your budget. Ones all setup, revise your kitchen properly. Step 5: Start Converting You Aim into Reality – This is the step where your physical work exceeds your logical and mind work. But don’t think that this step does not requires any brain work.Nothing like in the Universe is which does not requires the brain work. Yes, I meant “less brain work” from my those lines. So enough talking, lets get back on to our topic. So this step contains the physical work. What do you mean by it. Yes, you understood it nicely, Now it’s time to work. Start working according to map you have created and yes don’t let at least one one mistake to happen and if it happens, re-correct it. Finalize this step according to your map created and yes, how can we forget mathematics. Once all setup, verify your work and move forward to the next step. Step 6: Start Putting Some Real Spice In Your Vegetable – This is the step where comes the actual design. This step is something like more important than the previous one. It needs your art work. One single mistake can make you unhappy until it is renovated. So, do this work with more than the capacity you can do it. Do your coloring according to your map only.Once it’s done recheck and then fallow-on. Step 7: Verify with The Department of Buildings – Once everything setup, check your kitchen properly and make sure that it follows all the rules created by your Government and if it seems all crystal clear to you then send a report to The Department of Buildings service of your country to verify your new living and if the service returns a positive result then what ? enjoy the benefits of you new kitchen offer. Nowadays, basement kitchen ideas are becoming more and more popular with the TV serials, Movies and in many other ways and yes, it’s really a good idea but before using the idea one should explore all the cautions, rules and laws of The Government and other details in order to make his or living more happy. And yes, now I am confirmed that you are out of all of the volcanoes of the questions and your mind which became super-excited would now have been be cooled down.